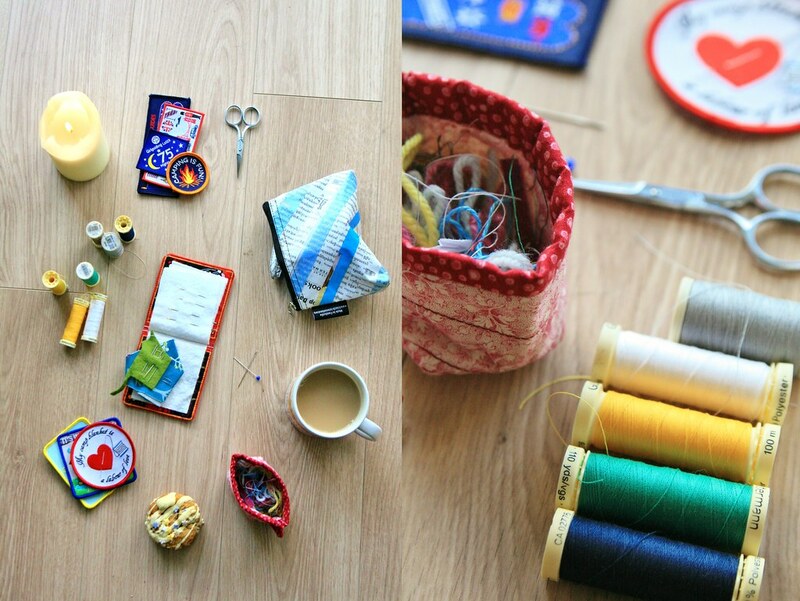 As the temperature drops and we snuggle warmly inside, it's nice to get stuck into a craft project or two. There is no project more cosy than my lovely camp blanket. I'm a leader with Girlguiding and when I was younger, I was a member as a Rainbow, a Brownie and a Guide. It was with my Guide unit aged around 11 that I first went on camp, discovered camp blankets and started my own. A camp blanket is a very simple idea: a large warm blanket that you wrap around you at camp when you're outside and it's chilly, when you're singing around the fire, when you're curled up in your sleeping bag, or, if your camps are like ours, you wear it over your pyjamas to first breakfast. Because we've usually got dressed by second breakfast. 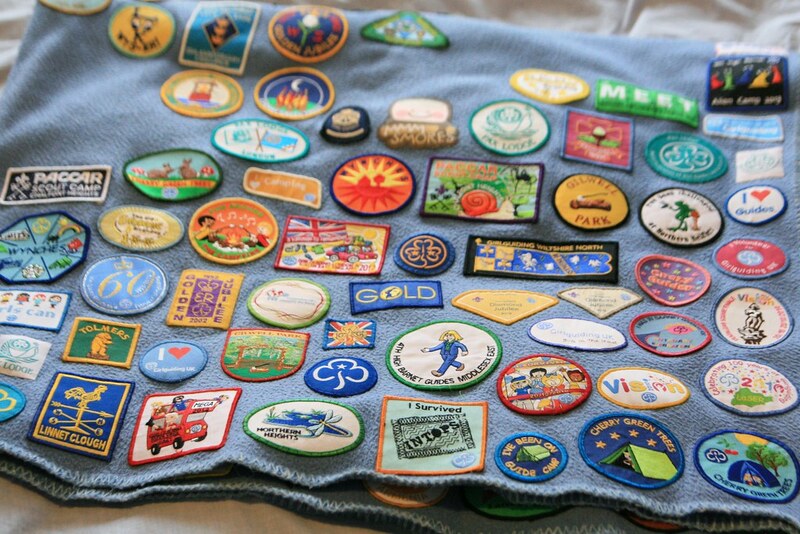 But what makes this blanket special is the fact that it is adorned with badges. My camp blanket is special. It traces my journey from being enrolled as a Rainbow aged 5, and getting my first promise badge, through being a Brownie and learning how much I loved to work on interest badges, right through to being a Guide and taking on more challenges, leading a patrol of my peers and earning badges with them. The blanket you see in these pictures is actually the second incarnation of my camp blanket. The first was dark green, heavy and woollen. But sadly my Guide unit closed, and it became too large to store. So the badges were carefully detached, mainly by my very sympathetic Mum, and the blanket went on its merry way. But I always kept that box of badges. And when I joined by current Guide unit five years ago, I knew I was going to need a new blanket. I found this large fleecy one online, cut a hole in the middle for my head to make it wearable poncho-style, and I've been sewing badges onto it ever since! My Mum was largely responsible for the sewing on my first blanket. 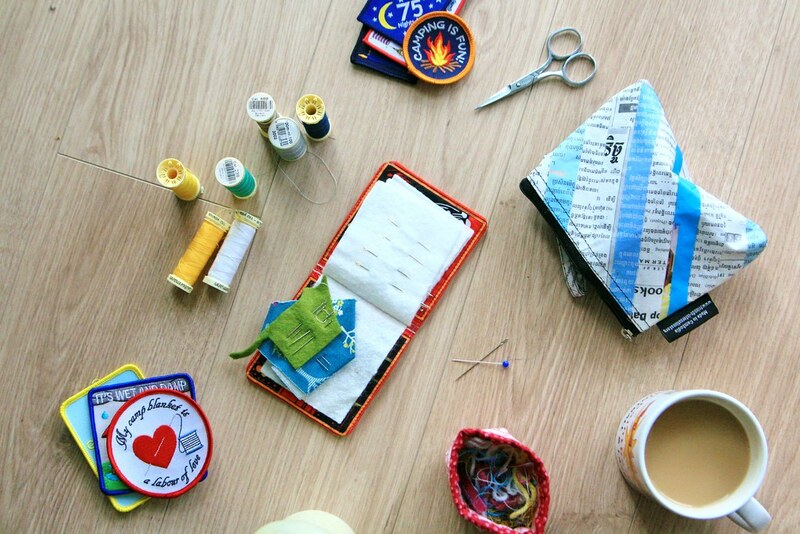 I remember being frustrated with the size of the thing, finding it unwieldy and time consuming just to sew on one badge, and the badge material was tough on my fingers; trying to poke the needle through made my fingers sore. 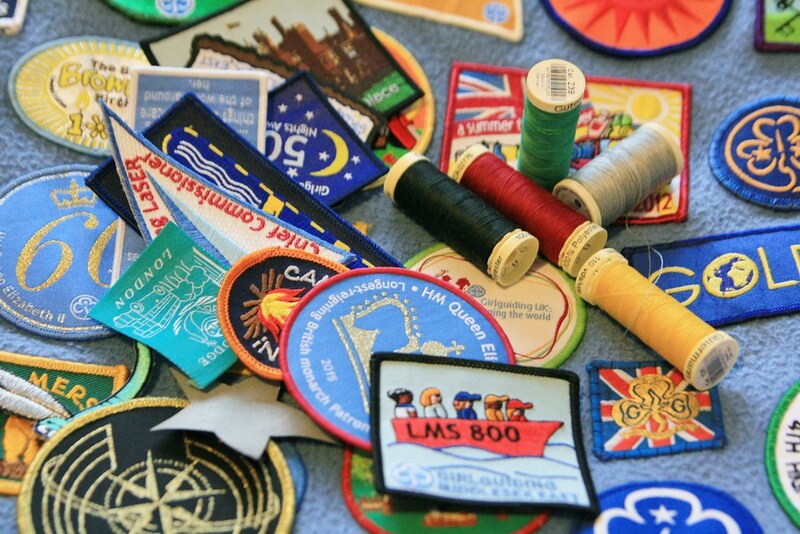 But my Mum could do it no trouble, and she could speed through them which meant more badges were sewn on more quickly. But now that I'm a bit older and wiser (and my fingers have toughened up somewhat) I enjoy spending time sewing on the badges, whether it's ten minutes to myself with a cup of tea and a biscuit, an evening in front of the telly, or a raucous night round a table with other Guide leaders, with a bottle of wine and a pincushion. It's very much a work in progress as there are a lot I still need to do. But it makes a wonderful Christmas project as it's warm and snuggly to work on, and each new badge recalls a memory that makes me smile. I have recently acquired a badge commemorating my participation in the Lord Mayor's Show, dressed as a boat and dancing along behind the Girlguiding float. 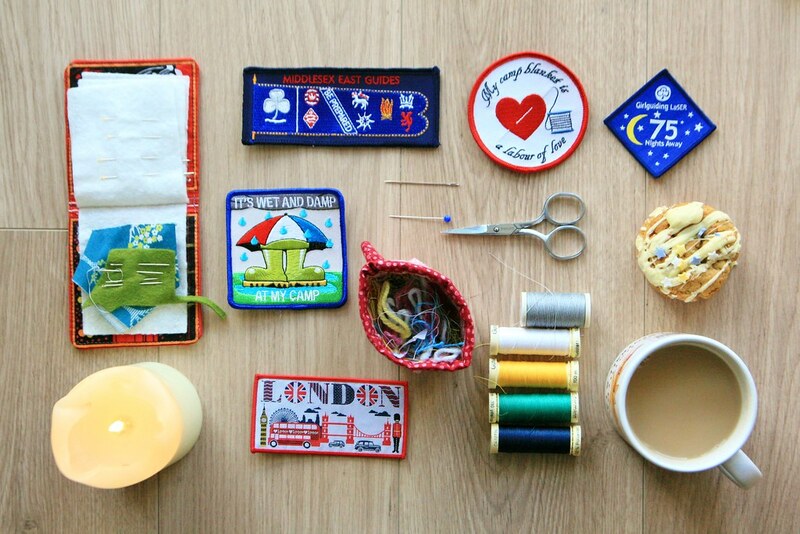 I have badges to sew on proclaiming that I have spent over 100 nights away with Girlguiding, to celebrate 100 years of Brownies, to commemorate the Queen's achievement of being the longest-reigning monarch. I have badges earned through volunteer projects in Cambodia, Armenia and Ecuador, and badges that were given to me by girls I helped attend projects in Malawi, India and Uganda. I have earned badges through developing my skills as a writer, aged 8, or as a swimmer aged 9, as a musician, a traveller and a crafter. And I have a badge that says I went to Secret Cinema's Star Wars, just because it's cool. 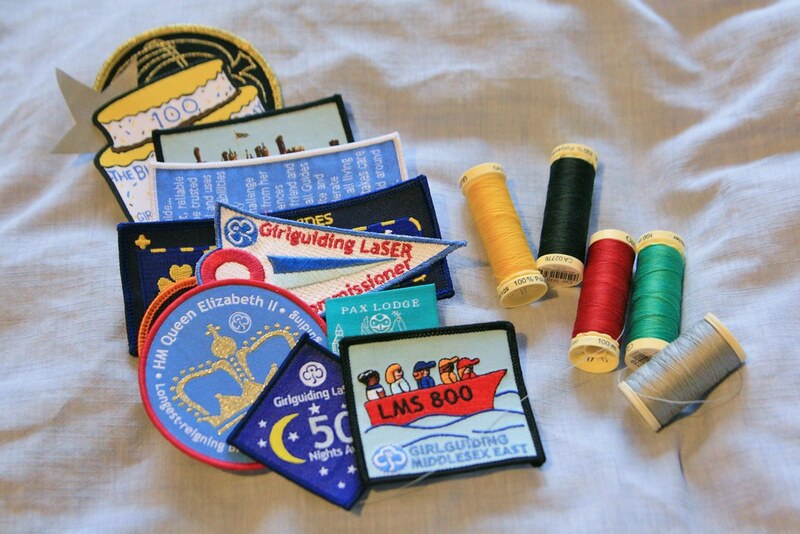 So it's a pleasure to sit down and work, little by little on this patchwork of memories, to wrap it round me and remember Girlguiding past, and imagine Girlguiding yet to come. P.S. This post is part of series I'm writing for Shimelle's online class Journal Your Christmas, capturing memories from this lovely festive season through pictures and stories. Your post has inspired me to make a camp blanket for my daughter. I had thought about adding them to her camp hat, but that will soon be filled up (after 5 years) and she only just started Guides (9 years old). The blanket provides more room :) Her current and previous units were very active and did so many fun adventures, making her a blanket is perfect. And once she starts sewing more, she can take it over. This is gorgeous! I felt all snuggly and warm just reading about it!